Ford Ranger Boot Space, Size, Seats | What Car? The Regular Cab version of the Ranger can seat two tall adults comfortably, but it's strictly a two-seater. 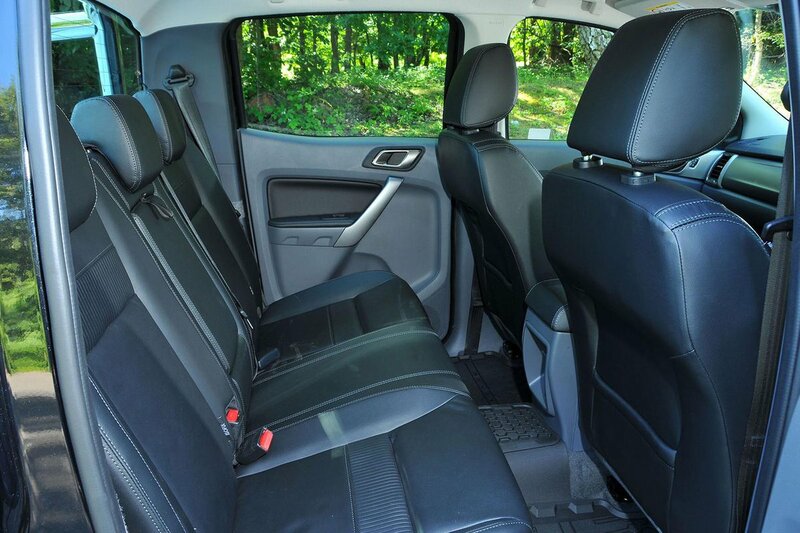 The Super Cab has a fold-down bench behind the front seats that will seat a further two, but adults will really struggle for leg room, because those seats are meant for only occasional use. The most spacious and practical Ranger – and, indeed, the one that we’d recommend – is the Double Cab. With lots of head and leg room front and rear, it will seat four tall adults relatively easily or five if those in the back don't mind a bit of shoulder rubbing. The fewer seats you have, the shorter the cab is and the longer the load bay becomes. That means the Regular Cab can carry the most gear, but even the Double Cab is able to fit a standard pallet in the back. Payload weight depends very much on cab type and engine, but most models will carry more than a tonne and some up to 1232kg. The majority of Rangers can tow 3500kg, while all can pull trailers or caravans up to 2500kg. The Ranger therefore mixes with the best in this respect, which includes the L200 and Amarok.